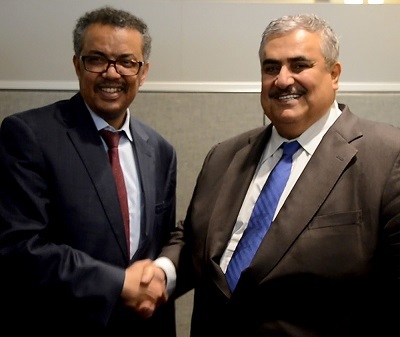 The Minister of Foreign Affairs, Shaikh Khalid bin Ahmed bin Mohammed Al Khalifa, met with the Minister of Foreign Affairs of the Federal Democratic Republic of Ethiopia, Tedros Adhanom, on the sidelines of the 71st session of the UN General Assembly being held in New York. They discussed the progress of outstanding ties between the two countries and the means of bolstering relations in various fields in view of the joint friendship ties as well as views on a number of issues of mutual interest. Shaikh Khalid also met with the Minister of Foreign Affairs of the Republic of Portugal, Augusto Santos Silva, expressing the keenness of the Kingdom of Bahrain to bolster relations and cooperation. He noted to the existing opportunities and components to boost cooperation in various fields for the benefit of joint interests. Mr Augusto Santos Silva affirmed his country’s keenness to bolster its relations with the Kingdom of Bahrain, praising the Kingdom’s progress and wishing Bahrain further prosperity.